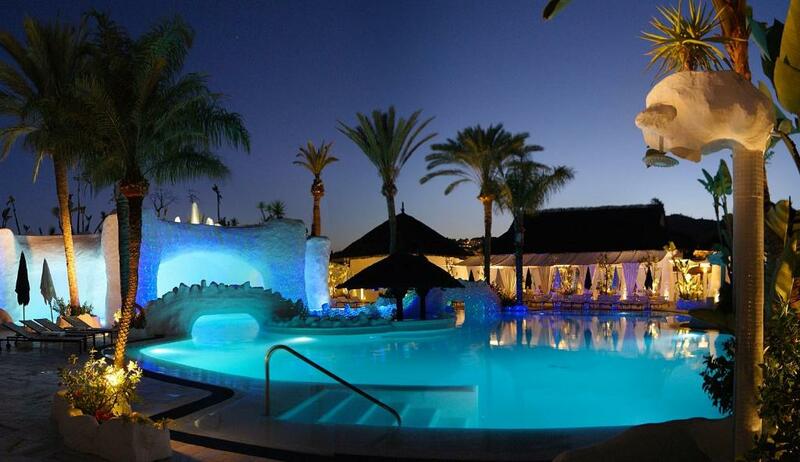 Lock in a great price for Hotel Suites Albayzin Del Mar – rated 8 by recent guests! The accommodation and staff were very good. The breakfast was good and the whole process of the stay was trouble free. Parking in the garage was great, if a little expensive at 16Euro per day. Overall it was a good place to stay. This place is amazing. We had a huge 2 bedroom apt. With a full kitchen, washer/dryer etc. We were off season, but you could tell this place would be great if full. Cool architecture like a 70s Moorish Palace, Lits of Mirror and details. Nice pool deck. The room, hotel and communal areas. Unfortunately weather was shocking so we couldn't use any of the outside areas. The space was nice. The breakfast was abundant but it would have been better with fresh fruit juices. Apartment was beautiful. Light and spacious. Very comfortable bed. 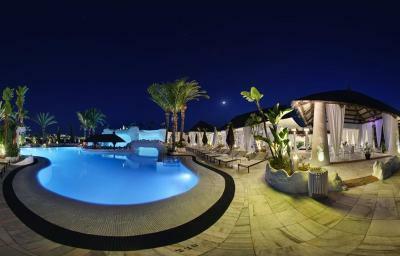 Hotel location, suite facilities, gardens and pool area all excellent. Garage parking a bonus in a very busy area. Extremely good options for breakfast and dinner. 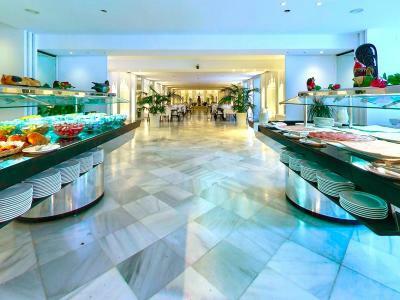 Hotel Suites Albayzin Del Mar This rating is a reflection of how the property compares to the industry standard when it comes to price, facilities and services available. It's based on a self-evaluation by the property. Use this rating to help choose your stay! 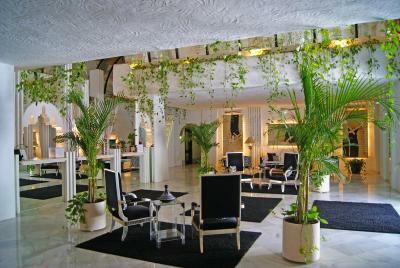 One of our top picks in Almuñécar.The luxurious Hotel Suites Albayzin del Mar is set within Isla del Ocio, in Almuñecar. 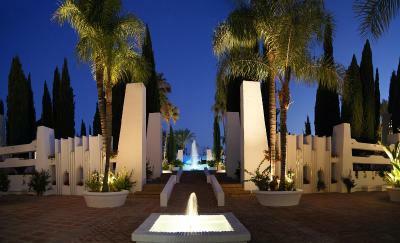 Located within a 1-hour drive of the Alhambra in Granada, this complex features a large outdoor pool complex. 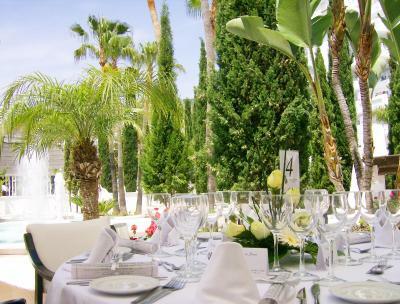 Set in Costa Tropical, the hotel's gardens have an Arab-Andalusian architecture, featuring waterfalls, bridges and grottoes that connect with the swimming pools. 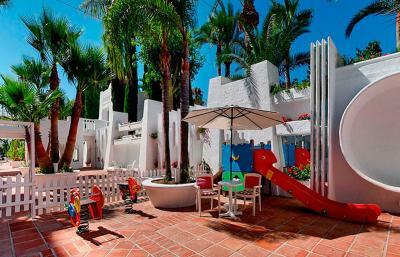 Each large, bright suite at the Albayzin del Mar has 2 or 3 bedrooms, air conditioning and heating. 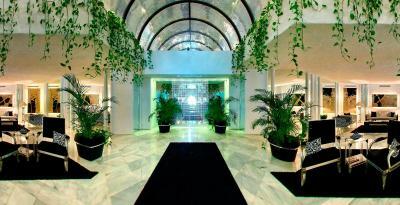 There is a large living room with satellite TV, a complete kitchenette, and a private terrace. The terrace offers wonderful views of Costa Tropical beaches and the surrounding mountains, located 0.6 mi away. 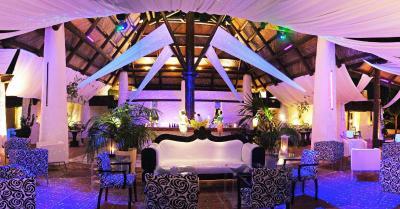 This hotel has an a la carte and buffet restaurant, a piano bar and poolside bar, games room and a children´s club. There is also a gym available, as well as billiards tables. 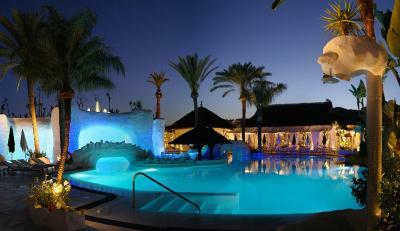 When would you like to stay at Hotel Suites Albayzin Del Mar? Air-conditioned suite with a terrace. The living room has a sofa and satellite TV. There is a hairdryer in the bathroom and the kitchenette includes a fridge, washing machine, coffee maker and oven or microwave. Public parking is available on site (reservation is not needed) and costs EUR 16.94 per day. Air-conditioned suite with a terrace. The living room has a sofa and satellite TV. There is a hairdryer in the bathroom and the kitchenette includes a fridge, coffee maker and oven or microwave. This suite has a double bedroom and a twin bedroom. It features a terrace, a living room and a well-equipped kitchen with oven or microwave. There is also a bathroom. Maximum capacity for this room: 4 people. This suite has a double bedroom and 2 twin bedrooms. It features a terrace, a living room and a well-equipped kitchen with oven or microwave. There is also a bathroom. Maximum capacity for this room: 6 people. This apartment features a flat-screen TV, microwave and washing machine. 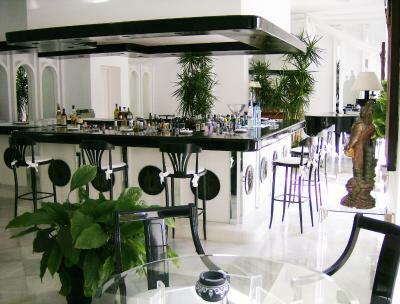 House Rules Hotel Suites Albayzin Del Mar takes special requests – add in the next step! Hotel Suites Albayzin Del Mar accepts these cards and reserves the right to temporarily hold an amount prior to arrival. Please note that there is a free children's club from 19 June to 13 September. The fact we paid over €300 for 1 night and still had to pay for parking. 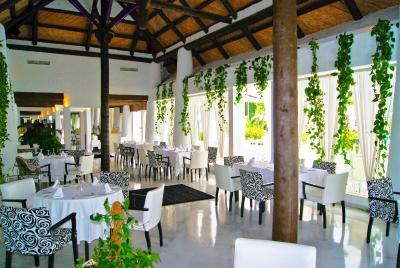 Off season -services, restaurant, dining at the hotel. I think if a hotel advertises that it has a bar and a restaurant these should be open regardless of occupancy levels. It didn't particularly bother us on this occasion but the bar was open from 19.00-20.00 on the Monday evening and not thereafter. Similarly, we were told that the restaurant was open for dinner on the Monday but only for lunch thereafter. 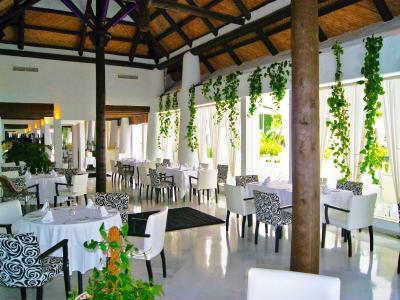 Although we were not dependent on the bar/restaurant for drinks/meals some people may wish to avail themselves of this facility during their stay. Pool water was extremely cold (colder than sea!! ), we could not swim in it. 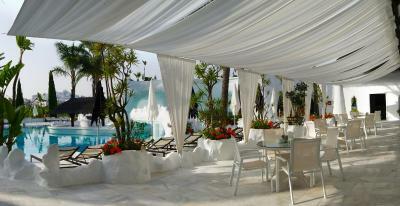 That was really a pity, since the pool area is very beautiful and well maintained. The lobby was new but the room seemed old. Breakfast and dinner were ok, but during longer stays a bit more variation would be appreciated. Apartment was very clean, however there were some signs of wear and tear especially in the bathrooms and the kitchen. Clean and spacious apartment, nice view from balcony to the pool area. Breakfast and dinner option was very convenient for a family. 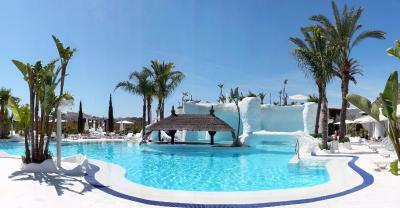 Beautiful pool area, not too crowded (2nd week of July). 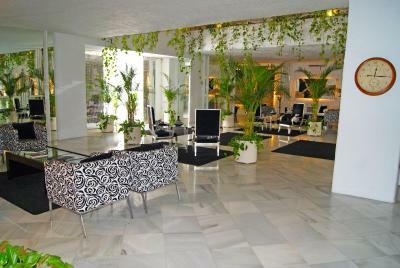 Good location, walking distance to the old town and beaches. At least an apartment facing the street was surprisingly loud during the night with all the traffic and lorries emptying the trashcans. Cleaning staff did not do the dishes or change towels, it would have been nice. I don’t mind doing the dishes but there was no soap to do so. Very tired property- knobs hanging off kitchen units, facilities not as advertised, there was no toaster, kettle or coffee maker that were all promised. The food was dreadful, ordered salmon fillet and was told it came with veg, it arrived in s gloopy packet sauce with a mound of tinned salty mushrooms- restaurant didn't open until 8.30pm wish we hadn't bothered waiting! A very strange layout, I should have realised that anywhere advertising toilet paper was provided was going to be strange. The kitchen is rather sparsely equipped, e.g. coffee machine and toaster only upon request - not sure they would have enough in the high season. No dishwasher.